Looking for a perfect favor for a religious event? Your guests of Christian faith will be delighted with these medallions! Your religious guests will appreciate a Madonna and Child that they can keep close at hand at all times. This stunning rendition comes in the form of a medallion on a key chain and makes a perfect keep-close accessory at home and at work. 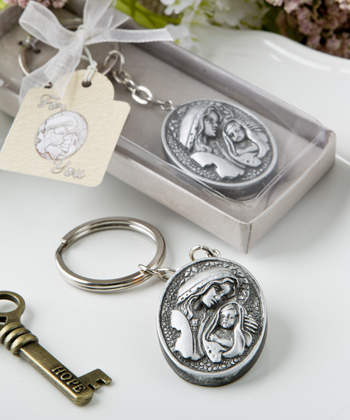 Crafted from poly resin with an antique silver finish, the design offers an artistic etching of Madonna and Child. The raised image on the medallion offers a luxurious and upmarket feeling that sets this keyring accessory apart from the rest. The medallion is attached to a metal chain and key ring. Adorn your tables with the glory of Mother and Child and offer your guests a meaningful and functional gift. Medallion size is 1 1/2" x 1"